These kids know nothing about ukabila and negative ethnicity unless they are being raised by tribalists and shall become so in their own adult life; it’s a circle that must be broken for good. On any given day, there are tribalists who if you ask them the path to State House for any of the serious candidates, they barrage you with tribal math of imagined scenarios of usually how their preferred candidate makes it there or how the one they don’t like or hate doesn’t. Some of us have held a view for a long time that Kenya has not only changed its government structure by way of the new constitution but attitudinally there has been a significant shift still in progress, which shall have an impact in the 2013 elections beyond what these tribalists can comprehend or do but are in denial. While tribalism may yet be a major factor in the electoral process for 2013, it shall by no means be the only and one determinative factor as has been the case for all elections heretofore. For the same reason, tribal lordship and bloc voting shall be proven to be less significant in 2013 in virtually all communities except for two areas: Luoland and Kikuyuland. One would have to be extremely naïve to think anyone but Raila is going to get the Luo vote. On the other hand, despite what I posit below, the Luos will be followed by Kikuyus in who they shall vote for en masse and as a bloc albeit to a much lesser extent for the reasons I offer below. Okay, give or take 2-5% of the registered voters representing extreme Luo Raila haters will vote for someone other than Raila at the presidential level but everyone else including ordinary haters from the region will at the end of the day pull the lever for Raila and ODM. This phenomena can be distinguished from all others where people vote as a bloc for “one of our own” for several reasons and we are here really talking about the Kikuyus—unless you consider the Kalenjins during the Moi era but even then it was less the phenomena it is among the Luos and Kikuyus, again of the two, one is understandable and justifiable but the other one is not for reasons I will attempt to expound on in this piece. When Kikuyus vote almost to a man for their own, the message is usually very clear: this thing is ours you would have to wrestle and pry it away from us as we are not just willingly going to give it up even for the sake of our country and if that means clinging to power by any means as was the case in 2007, so be it. Fortunately, more and more progressive Kikuyus are rejecting this thinking as evinced by an emergence of a number of Kikuyu organizations championing inclusion, cohesion and national unity such as Kikuyus for Change and others. Ditto for leaders from the region like Hon. Martha Karua who have publicly declared they’d rather work with Raila than support Uhuru merely because he is Kikuyu—a very commendable outlook on life more brothers and sisters from the area should embrace. A good segment of “old moneyed” and former powerful leaders from the region have also rejected this thinking with some like the renowned former Attorney General Charles Njonjo outright declaring Raila tosha. Others are prominent businessman and MP for Kiambaa Hon. Stanley Munga Githunguri and former Foreign Affairs Minister Dr. Munyua Waiyaki. There are many others this writer is aware of who are waiting to publicly declare their support for Raila once the coast clears, so to speak. There is a lot of chatter and noise these men and women would rather speak when they can be heard and that time is fast approaching. Granted, many of these are from one side of the River Chania, even though Raila has not given up on reaching out to folk on the other side of the river. No one can be in the minds of these politicians to know exactly what motivates them to take the position they have with respect to Raila but it is quite logical and proper to say no, this has nothing to do with the rivalry between the two cousins from Kiambu and Nyeri primarily because there is no one from Nyeri seriously vying and Kibaki himself has been rather coy as to publicly declare who he supports, even though one can easily put two and two together to know who his project is. A good case can be made that project is, in fact, dead and Kibaki and Co must be scrambling to figure out what to do next as the Raila train rumbles on to the intended destination of State House. Now, a more convincing case can be made these wealthy and influential men from Kiambu are simply making a statement enough of the “we must vote for our own win or lose” mentality and are saying it’s about time we all as Kenyans voted for our leaders on the basis of their leadership ability rather than where they hail from. This is a message Raila has been driving home for years and the fact these men have heeded it partly because of Raila’s efforts to reach out to them and partly because of their own volition and belief, speaks volumes as to what to expect in the new Kenya and in particular come 2013 elections. Raila has been reaching out not just to these wealthy and influential men and women from the former Central, he has also consistent with who he is done and continues to do a good job in reaching out and delivering a message of hope to the very poor and those struggling to make ends meet from the region whose desires and needs are no different from the rest of the country he hopes to transform for the better and for good if Kenyans once again give him the nod but be sworn this time as our next president. Raila’s outreach efforts in Kikuyuland is no different than what he is doing in other regions of the country except obviously Luoland to make sure when the votes are counted in the first ballot, he garners enough votes to propel him to State House as our next president consistent with the constitutionally mandated 50% + 1 of the total votes cast in addition to carrying at least 25% of the vote in at least 24 of the 47 counties. The thinking behind this strategy has to be there is no vote to ignore or take for granted—again, with the exception of the Luo vote for Raila which one may rightly and not unreasonably assume is his no matter what. Which brings us to the question of whether Luos voting for Raila as a bloc is a desirable thing or is it a form of tribalism? Luos voting as a bloc for Raila is not undesirable neither is it a form of tribalism for several reasons. First, voting as a bloc is not necessarily a bad thing; what is bad or evil is the reason for doing so. When Luos vote to the man for Raila, many may be voting for him simply because he is one of their own, which is wrong but it is equally the case Raila is actually the best qualified among all those vying so there is absolutely nothing wrong with Luos or any community for that matter voting to a man for him for doing otherwise one would have to vote for someone less qualified, which is wrong in by itself. Second, a related reason why voting as bloc is not necessarily a bad thing is a leader cannot expect to have any serious impact or be taken seriously at the national level unless he can demonstrate his or her people who should know him or her best are behind his quest. In the United States, a presidential candidate by the name Al Gore failed to capture the presidency in that country’s 2000 elections because he failed to carry his own home state of Tennessee, which forced the comical state of Florida chat examination in the hopes finding enough votes to give gore a majority but none were forthcoming so the US Supreme Court decided to appoint the not too brilliant George W Bush as president. George W went on to serve two terms marked only in how unremarkable his presidency was other than digging Americans into a hole Obama has been trying to dig them out of ever since he took over as president. In Kenya, the Mudavadi project was quickly dismissed by everyone even by those who conceived it because the man has proven to be a weak and indecisive leader who cannot even deliver a fraction of the Luhya vote to himself or to anyone, let alone the entire community. The point being, to be taken seriously as a leader, one must show command and control of his own backyard vote—granted some get an excess of this love and support beyond the simple majority or even super-majority but one can’t blame them or their community for such support provided its grounded on substantive grounds such as their demonstrated leadership ability and not just mere tribal loyalty and this is precisely the case in Raila near total support in Luoland. Third, unlike one community we know that has historically been adamant in not voting for none other than their own regardless of the prospects of that person winning, Luos have actually historically voted for ironically a presidential candidate from the same community that has historically not voted for anyone other than their own, which means their bloc voting is not based on a belief no one else is or can be president other than their own—a major distinction between benign and invidious bloc voting. That being said, bloc voting is quickly becoming a thing of the past in all communities. Abagusii, the most independent voter community in the country long ago rejected the idea of bloc voting and have for all seriously contended presidential elections split their votes. Nearly all other communities—and again I am here excepting the Luo will genuinely split their vote. Even the Kikuyus who are the exact opposite when it comes to split voting will this time around split their vote regardless of whether Uhuru vies or not such that those not from the region who have been courting their votes (read Raila) will harvest a good chunk of votes from there to make a difference not only numerically electorally speaking but the outcome will change the nature and style of politics forever. The Kalenjin are also poised to split their vote with Raila being the net benefactor unless Ruto joins him in which case we are talking a landslide victory for Raila come 2013 much as was the case in 2007. Were Ruto not to join Raila, the PM has made and continues to make sufficient progress in regaining lost ground in the region such that when all is said and done, common sense and practical politics would have ensured his carrying of a significant chunk of the vote there to again make a difference in propelling him to State House whether Ruto joins him or not. A good indicator of that was his meeting over the weekend with more than 600 Kalenjin elders from North Rift Valley where he was jubilantly joined by Kosgey, Kosgey and Bett, which sounds like a good firm name and they are, indeed, a good team that exudes confidence in delivering a good and significant portion of the vote from the whole Rift Valley region. Ruto had better take note and act wisely in joining them or be left leaking his own self-inflicted wounds. Same analysis holds true for the Luhya community, which is equally poised to split its vote in favor of Raila. Notice how no one is pleading with Mudavadi to return to ODM much as some of us are pleading with Ruto to do so. This is because it’s a foregone conclusion Mudavadi cannot make a difference in anyone vying for the presidency, including himself. There are a number of abana ba ingo who are quite capable of delivering the Luhya vote compared to Mudavadi and those are the ones to watch how they proceed even though thus far their posture is again in favor of Raila. Even if one were to remove all these ancillary factors such as who is aligned with who in Luyland, in a head to head match-up between Raila and Mudavadi for the Luyya vote, Raila wins handsomely and hands down. So does Raila win in any match-up against anyone nationally and thus the reason for this breathless efforts to gang-up against him. What stands in the way of these gang mentality is the people’s resolve not to bloc vote as previously. Much as the Kikuyus, Kales and Luhyas will not bloc vote in 2013, the rest of the communities will follow suit—again benefitting Raila who is the only candidate who has seriously and genuinely mounted a 47-county campaign strategy as opposed to his opponents who as noted above either individually or collectively only talk of ganging up against him or otherwise simply trying to block him from becoming president instead of making the case why they are better than he—a strategy one can understand because they cannot make such a case. The split-voting discussed here should not be confused by the various efforts underway to split communities in favor of some preferred candidate by those so scheming as that type of conniving, too, is destined to fail much as the tribal arithmetic and mentality shall in the new Kenya. In sum, a Raila presidency will mean an end to tribalism as we know it and an ushering in of a new pattern of voting in Kenya. That’s not a small order, given we have tribalism so entrenched even those who are or claim to be educated and/or well informed are cursed with the vice to hear them defend their tribal based politics and beliefs in the guise of offering an opinion is unnerving save for the faith and belief many otherwise progressive minds have that even they shall sooner than later come to see the light of day and shun the backwardness. That will be the day we shall all join forces in building a much more prosperous and peaceful nation. Meanwhile, having Raila and other reform minded individuals and leaders elected or re-elected to office—as the case may be shall begin the journey toward that noble end; an end those of us speeding past middle age will live to witness and certainly a phenomena all of us must agree has to be the in thing for our children and in infinity. I am talking about charting a course for our beloved country free of ukabila and negative ethnicity save for where it’s necessary such as cultural preservation and only and only then. Okay, at least charting a course for our beloved country more free of ukabila and negative ethnicity as one would have to resign there are those unfortunately who may not as easily shake the vice. Let’s all join in congratulating the Right Hon. Prime Minister Raila Odinga and MP for Langata for yet again another development success story this one in his individual capacity involving continued improvement of educational opportunities in Kibera. 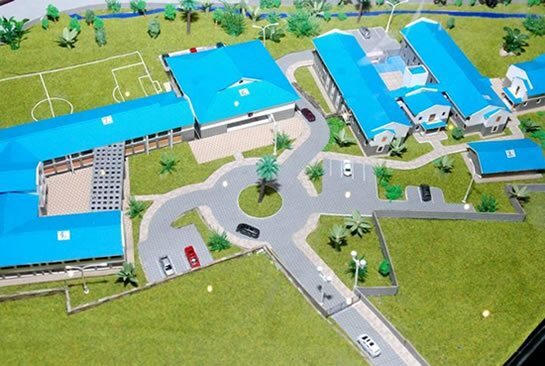 The Raila Education Center, one of the many initiatives and projects undertaken by Raila in his individual capacity and as a way of contribution back to society, is set to build a new ultra-modern school at the center. The new school will be a center of academic excellence and will admit students from the East Africa region who will have the Research, Innovation, Science, Engineering and Math (RISEM) driven education as their foundation. During the during the ground-breaking ceremony at the center in Kibera this week, Prime Minister Raila Odinga revealed that the education center will be built in three phases. The first phase includes the construction of 14 classrooms and a girls’ hostel. A state-of-the-art library and laboratory will be put up in the second phase. Finally, a sports academy will be built, which is expected to double the number of students at the center. The center currently has more than 1,116 children in its primary and secondary school, 64% of who are orphans from informal settlements. The Raila Educational Centre (REC) is located in the heart of Kibera, a slum with an estimated population of approximately 500,000 situated on less than 5% of Nairobi’s land mass. While many families cannot afford to pay school fees, REC provides students with opportunities and a quality education to uplift themselves out of their current conditions. Where a sense of hopelessness is common throughout the Kibera slum, REC students are resilient and strive for academic excellence and to become well rounded individuals. Given the inadequacies in public schools infrastructure, REC provides access to education wherein students are able to enroll in the school to undertake both their primary and secondary education. In addition, there is a free lunch program, provided by First Love organization, to ensure students have a good balanced diet, critical for their development and academic success. Again, let’s commend the PM for these worthy accomplishments and wish him success as he continues to provide leadership in achieving even more success for all Kenyans.